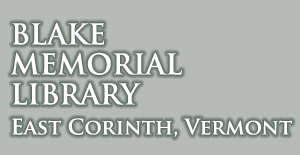 The Blake Memorial Library and the East Corinth Congregational Church are teaming up to sponsor a potluck dinner followed by an evening of secular community singing on Friday,March 15th, starting at 5:30. Please note: this event with take place at the church. Children and families welcome! Have a song request? Contact event coordinator Wendy Heidenreich @ 439-6170 or epicen@gmail.com prior to the event, and she’ll do her best to provide lyrics. Play an instrument or have a favorite song book? Feel free to bring them along. No musical experience necessary to enjoy this event.